Summary: Growing up in the suburban hell of Misery Saga (a.k.a. Mississauga), Lizzie has never liked the way she looks—even though her best friend Mel says she’s the pretty one. She starts dating guys online, but she’s afraid to send pictures, even when her skinny friend China does her makeup: she knows no one would want her if they could really see her. So she starts to lose. With punishing drive, she counts almonds consumed, miles logged, pounds dropped. She fights her way into coveted dresses. She grows up and gets thin, navigating double-edged validation from her mother, her friends, her husband, her reflection in the mirror. But no matter how much she loses, will she ever see herself as anything other than a fat girl? I don't make it a habit of picking up books that I don't think I will enjoy, but I have to say I was pleasantly surprised by just how much I liked 13 WAYS OF LOOKING AT A FAT GIRL by Mona Awad. This novel is a collection of thirteen vignettes that look at Lizzie March and the issues she has with being a "fat girl"... even when she is no longer fat! This is the debut novel by author Awad, and she has definitely proven herself as one very talented writer. 13 WAYS OF LOOKING AT A FAT GIRL begins when Lizzie March is just a teenager and follows her life as she meets guys, makes new friends, gets married, and loses lots of weight. Each chapter is almost a short story which gives insight into how Lizzie as she evolves/changes into a new person. She actually even chooses to go by Elizabeth when she begins losing weight! The novel is both extremely funny and touching, and Lizzie is such a real character. I guarantee you won't be able to get Lizzie and her insecurities out of your mind. As is the case with any collection of stories, there are some that I appreciated more than others; however, I can honestly say that all of them have merit and contribute to the development of Lizzie's character. My heart broke for her in one story when she spent hours trying to get a flattering picture of herself to send to an on-line boyfriend. Similarly, I thought the story about the relationship with her mother was especially powerful... and really well done. What I found interesting is that even as Lizzie/Elizabeth lost more and more weight (and fought to maintain it! ), she still struggled with self-acceptance issues. She really wasn't able to have "normal" relationships because she was such a victim of the image she had of her body. When I look back at 13 WAYS OF LOOKING AT A FAT GIRL, I realize that so much of the story was truly sad. Over and over again, Lizzie just made me sick with how much she hated herself. What's even more upsetting is that she's not just a fictional character who has issues. There are many women just like Lizzie who can't embrace life or themselves because of their negative self-image. I think 13 WAYS OF LOOKING AT A FAT GIRL is an extremely important book, and I think it will generate a lot of thought when it comes to girls, women, and society's expectations of appearances. 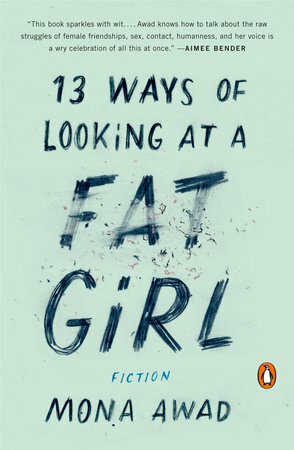 Having said that, I don't want you to think that 13 WAYS OF LOOKING AT A FAT GIRL is totally depressing. It's actually a very funny novel. Ms. Awad's prose is extremely smart and witty, and there are many moments in these stories when you will laugh out load. I take my hat off to the author for being able to create such a memorable (and real) character while at the same time addressing some important issues, and at the same time, making me laugh! 13 WAYS OF LOOKING AT A FAT GIRL would make a great book club pick especially for a group of women. I wasn't able to find a formal discussion guide, but I don't think one is necessary. There is a great deal to discuss about Lizzie's behavior. Some of the themes you might want to explore include self-acceptance, changes, marriage, mother/daughter relationships, society's expectations, personal expectations, pressure, body image, and food! 13 WAYS OF LOOKING AT A FAT GIRL is an excellent debut by a very talented author. I look forward to more from Ms. Awad in the future! I think what's really sad is how many girls feel like Lizzie. This sounds like an important book.